The Magic Formula that makes work optional. This surprisingly simple, extremely powerful new method makes it not just possible — but guaranteed. Maybe you're really good at what you do. Maybe your job makes a difference in people's health or safety or well-being. Maybe you love your colleagues and have a great office social life. Maybe some or all of those things are true. But I bet the first answer that popped into your head when you read that question — before you even really thought about it — was: "Because I have to." Well, for just a minute, I'd like you to imagine what your life would be like if that weren't the case. Imagine what your life would be like if you didn't have to work. Now, notice I'm not saying, "if you didn't work"; I'm saying, "if you didn't have to work." Chances are, you would continue to work to some extent even if you didn't have to. Most people in that position still do. You might keep doing what you do now, even at the same place, only with a lot less stress and a lot more enjoyment. Or you might decide to pursue something new. Maybe you'd take a nice chunk of time off to figure out what it should be. But you'd never again feel resentful about work. You'd never daydream about how much happier you'd be in a different job. Never wonder, "will I be doing this for the rest of my life?" Or pass up an opportunity to do something you think you'd enjoy more, for fear of losing your financial security. Why would you? The part of the work equation that causes all those things, the "have to" part, would be gone. Take me, for example. I work — a lot, actually. But I work only because I found something I am absolutely passionate about doing, that makes me very, very happy. If it didn't, I could shut it all down tomorrow and it wouldn't matter a bit. My kids' college fund wouldn't be in jeopardy. My wife and I would still be looking forward to the same comfortable retirement we're on track toward now. Our family could continue with exactly the same lifestyle we have, in the same great house, enjoying all the same things we enjoy today. See what I mean? I do work. I want to work. But I don't "have to" work. While you're still young and active enough to enjoy it, you too can have a work-optional life. You see, I'm not in this position because I was born into wealth or privilege. My childhood was happy. But it was also pretty poor. Growing up in the tiny apartment I shared with my mom and sister, two things fascinated me. The first was the fact that some people had so much in life and others — like us — had so little. In fact, I loved magic so much as a kid that I started to investigate it. I just had to know how those amazing, mesmerizing figures up on stage did what they did. Of course, as anyone who scratches the surface of magic soon realizes, there is no "magic" to it at all. It's all knowledge, skill, and technique. Magic isn't about mystery. It's about mastery. From a very early age, I set out to create that wealthy, comfortable, burden-free life for myself and the people I loved. Today, I'm living a life that's even better than the one I dreamed of back when I was a poor kid in that little apartment. I have a huge house with a staff. I travel all over the world with my wife and three kids. I have no wants or worries. I still consider it magical. It IS magical. But how I got here is no mystery. About 20 years ago, I made a discovery that changed everything for me. Up until then, I'd been working hard to make good on my childhood promise to myself. I'd left school early to enter the workforce, and by the time my classmates were graduating from college, I was hiring people their age to work under me. I was moving up fast, and the money was coming in. But the days were tough and the hours were long. I had begun to wonder just how long I could keep it up, if I'd ever get to where I wanted to be — and if I even knew where that was. Then I landed on this discovery. Suddenly, I had absolute clarity about what I wanted out of life. Not just the "wealth," "success," and "happiness" I'd longed for as a kid, but a precise, detailed definition of what those things meant for me, personally. But that wasn't the best part. I also had a crystal-clear awareness of exactly when I would have those things: the actual number that would ensure I never "had to" work again. Immediately, I set about crafting a detailed plan to close the gap between where I was and that magical point in the future in the shortest amount of time possible. I called it my "Magic Formula." And it WORKED. Today I am completely, permanently financially free. All because I mastered a certain set of "tricks" that enabled me to conjure up an incredible life. My Magic Formula worked so well for me, and was so simple and straightforward, I knew it could work for others, too. I was right. I've been sharing it for 20 years now, with all sorts of people at every stage of life. The difference it has made to them has been amazing. Middle-income people have gotten wealthy using this formula. Wealthy people have gotten wealthier using it. People nearing retirement have used it to transition into a profitable and rewarding "second act" doing something they really love — and quickly adding tens and even hundreds of thousands MORE dollars to their next egg. Young people have used it to hone in on the right career path from the very start, and create a life that utilizes their talents, reflects their passions, AND builds their wealth. All of them know with absolute certainty their magic number — the point at which they won't have to work anymore. And because they're following the formula, they're all on track to get there shockingly sooner than any of them had thought possible. 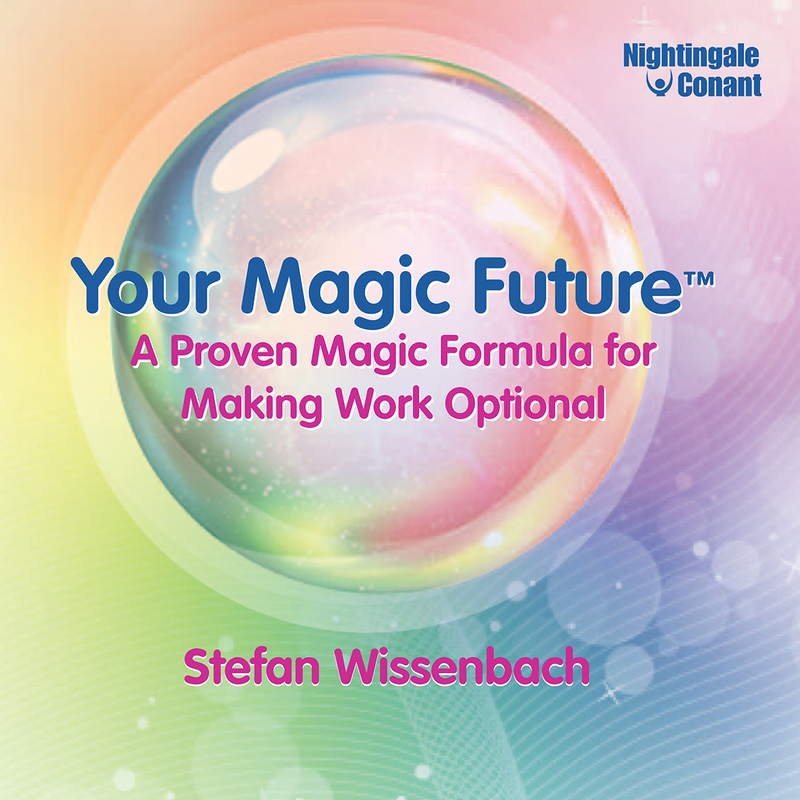 If you're ready to stop working because you "have to", and start living the way you WANT to, then allow me to send you, completely risk-free, my Nightingale-Conant program Your Magic Future™: A Proven Magic Formula for Making Work Optional. 2) CREATE A SIMPLE, COMPLETELY CUSTOMIZED PLAN for significantly shortening the amount of time it will take for you to get there. In six audio sessions, I'll lay out the complete Magic Formula process and personally guide you through each and every step of it. I'll give you the hows and whys behind every secret and strategy, and share real-life stories that illustrate how each one plays out in the actual everyday world. A 124-page writable PDF workbook is where you'll translate all of that information and inspiration into your own nuts-and-bolts action plan — the Magic Map that will bullet you toward your work-optional date. As you do so, you'll also be installing the principles and strategies of the Formula at the deepest levels of your mind. Soon they'll become an automatic part of your operating system. finished the program. The change you'll have experienced will amaze you! automatically flowing your way that used to pass you by. way you can't even begin to imagine. quarterly, and never fail to find some. One of the wisest time investments you can make! with them in a way that will massively benefit both of you. whether or not you're on track to get it)… and SO MUCH MORE! and how quickly you can achieve it. Within minutes of listening to Your Magic Future, you'll know how to calculate your personal Magic Number. Then, following the five-point M.A.G.I.C. process I lay out for you in the rest of the program, you'll create a simple, elegant plan that will get you to that point in an incredibly short amount of time. By the time you're finished, you'll possess a formula that you can recall at will, any time, and easily apply to whatever you are doing in that moment. That's the real key. This formula is designed to saturate every aspect of your life. The things you already do well, you'll do even BETTER. The things you should be doing but aren't, you'll START doing. And all the pieces will be working together in perfect harmony to move you at high speed toward that work-optional date. Being a user of this formula myself and having guided many others through it, I can tell you that you'll start to notice the impact very quickly. Your mindset will change almost instantly. Within just a month, you'll start seeing the dollars-and-cents improvements that will really get you energized and motivated to keep going. And in one year from now, you will look back and be absolutely AMAZED with the progress you've made. Financially, to be sure — but in so many other areas as well. You'll be happier at work, and it will show in your productivity and profits. You'll be calmer, more confident, more relaxed. And you'll be more excited about the future than you may ever have been before. I know you wouldn't have bothered to read this entire letter if you weren't seriously interested in achieving a work-optional life sooner than you're on pace to right now. That right there tells me that you're the kind of person this formula has a very high likelihood of working for. But don't take my word for it. Find out for yourself, without any risk at all. Order Your Magic Future™ today, and start moving with lightning speed toward the day when you can stop "having to" work forever. I can tell you from personal experience that will be the FIRST of many best days of the rest of your life. I want to possess a formula that I can recall at will, any time, and easily apply to whatever I'm doing in that moment. Please send me Stefan Wissenbach's audio program Your Magic Future, at the special price below. - I can select one of two ways of ordering.